Our dear, sweet Mom left us to be with our Dad, her Heavenly Father, and all of her siblings in the early morning of April 3, 2019. 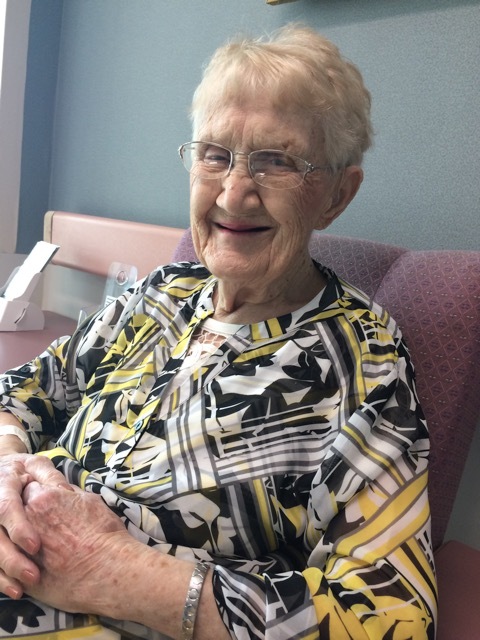 She passed peacefully at her home in Pineview Terrace, Prince Albert. She was 93 years old. Mom was the youngest of six children born to Scottish immigrants, the last of her generation. She was born prematurely in Regina, Sask. on June 22, 1925. They said it was a miracle she survived, and survive she did! She grew up in small town Saskatchewan as her father, Rev. D.G. Rice, was a missionary preacher for the newly formed United Church of Canada. They lived in Condie, Disley, Bengough, Mervin, Birch Hills and Prince Albert, in the penniless dust-bowl prairie days where her Dad was often paid in chickens and home cooking for presiding over weddings, baptisms and funerals. 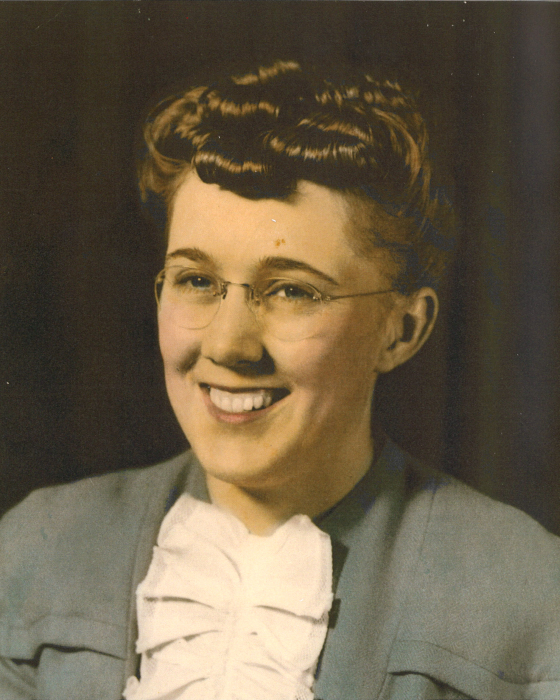 Following high school graduation from Birch Hills, Mom attended Normal School in Saskatoon and taught for a few years in one-room schoolhouses in Paddockwood and Clouston, where her duties included hauling in firewood and water for the day. She later took Deaconess Training in Toronto, and upon returning to Saskatchewan, worked in her parish district alongside her father. She later enrolled in business school in Saskatoon, which was where she caught the eye of a charismatic, talkative Frenchman with wavy black hair, Delphis Bernard. Mom married our Dad on July 1, 1954 and settled in Prince Albert, where mom took on the role of homemaker. Together they raised their six children who were born in a span of seven years. They were married for 41 years before Dad passed away suddenly in 1995. Life was not easy for our parents due to a tiny household budget and Dad’s physical disability, but Mom’s Scottish grit and our parents faith in God got us all through. Mom was very musical and had a gifted soprano voice, and we fondly recall gathering around the piano as children to hear tunes from the old Reader’s Digest songbook. She was artistic, a writer who published poems and stories, and loved reading even into her last years, devouring books delivered from the local library, often six novels in a week. She had a quick wit, and was competitive even in her later years. She often spent time challenging her children and grandchildren to games of Bananagrams and word search puzzles. Having an adventurous spirit, she enjoyed traveling, and travelled both with her husband to Europe and with her daughters throughout Canada. She was lucky enough to be able to dip her feet in both oceans. After we left home, Mom became a nanny for a few families before retiring in her 60s. She was an active member of her church congregation, where she sang with the choir and read scriptures. She volunteered with our elementary schools, and on the social board of the apartment building where she and Dad retired. Above all, she was our mother and we were the focus of her life. She loved us all, accepted our uniqueness, and encouraged us to seek our full potential. She celebrated our victories, grieved with us our losses, and continued to be involved in all of our days with genuine interest, questioning the most minute details of our lives during our visits and phone calls. She welcomed thirteen grandchildren and six great-grandchildren with overwhelming love and joy, considering each to be a great blessing. In her fading years, when asked what she would like for a birthday or Christmas gift, she always said, “All my children, grandchildren and great-grandchildren under one roof.” Rest easy Mom. Your work is all done. Your song is over, but your melody will ring on through the lives of everyone you have touched in the 93 years you were here with us. Pearl is survived by her six children: Jewel Buhay (Rodger Reid) of Campbell River, B.C. and their children: Dr. Jeremy Buhay, Ryan Buhay (Liza Pottinger) and Jessica Reid; Catherine Bernard of Regina; Beth Gobeil (Laurier) of Prince Albert and their children: Katie (Kurtis Drader) and great-grandchildren Elijah & Izabel, Amy (Tyler Little), Donovan (Carla Olsen) and Stephen Gobeil; Peter Bernard (JoAnn Latta) of Campbell River; Ghislaine Hunt (Robert) of Prince Albert and their: children Jason Tatlow (Jessica) and great-grandchildren: Dylan, Jackson and Jorja, Jacquie Tatlow (Travis Kenney) and great-grandson: Jaykob Stratychuk, Danielle Hunt (Ben Lacaille), Joshua Hunt (Stephanie Brookes); Gregor Bernard of Campbell River and his children: Samuel Bernard (Eleni Scherlowski) and Celina Bernard. She is also survived by many nieces and nephews and her three brothers-in-law: Paul Bernard, Rosaire (Darlene) Bernard, and Louis Pilon; and long-time friends: Barbara & Owen Rance. Pearl was predeceased by her husband: J.R. Delphis Bernard; infant son: Anthony; her parents: Rev. D.G. Rice and Annie (Bissell) Rice; and her siblings and their spouses: Jessie “Nettie” (Frank) Demaine, May (Jock ) Russell, Greg (Pearl) Rice, Bruce (Isobel) Rice, Nancy (Bill) Watson; her mother-in-law: Rose-Alma Bernard; and two sisters-in-law: Esther Pilon and Bernadette (Gerard) Grenier; three brothers-in-law: Francis Bernard, Jean (Betty) Bernard, and Emery (Dolores) Bernard: and by four nephews and a niece. The family owes a large debt of gratitude to those who so lovingly assisted with Mom’s care in her final years: Angie Kopera and all the staff of Kopera’s Care Home; the nursing staff, CCAs and Recreation Workers at Pineview Terrace; and Dr. Sriram. We would also like to thank our friends and relatives, too numerous to mention who have been so kind to each of Pearl’s children since Mom’s passing. A Celebration of Pearl’s life will be held on Saturday, April 20, 2019 at 11 a.m. at Calvary United Church, Rev. Craig Hollands officiating. A lunch will follow in the church hall. Inurnment will take place at Prince Albert Memorial Gardens. In lieu of other tributes to Pearl, please consider performing a random act of kindness for someone who may be in need of encouragement or consider making a donation to: Cystic Fibrosis Research, Cystic Fibrosis Canada (ack. Pearl Bernard), 2323 Yonge St., Suite 800, Toronto, ON, M4P 2C9, cysticfibrosis.ca or: Canadian Cancer Society, (ack. Pearl Bernard), Metastatic Breast Cancer Research, Unit 54, 11th St. East, Prince Albert, SK, S6V 0Z9. Family and friends wishing to send online condolences are welcome to visit www.beaulacfuneralhome.com. Arrangements have been entrusted to the care of Beau “Lac” Funeral Home, Lorne Adams - Funeral Director, Prince Albert, SK 306-763-3322. There's still time to send flowers to the Celebration of Life at the Calvary United Church at 11:00 AM on April 20, 2019.